We’re relaunching Tribune because its politics endures. This year marks the fortieth anniversary of Eric Hobsbawm’s influential address The Forward March of Labour Halted? It arrived at a seminal moment in the Left’s history, as the hope for a ‘red’ 1970s, prompted by Labour’s 1974 victory and the fall of dictatorships in Spain, Portugal and Greece, evaporated into the realities of neoliberal advance. Though Hobsbawm is remembered in Labour circles for laying intellectual foundations for the party’s ‘modernisers,’ he is better recalled as a formidable Marxist historian — and many of his assertions in that 1978 speech were vindicated. Its central thesis was that the industrial working-class, the core of the labour movement which built social democracy, was in historic decline and could no longer claim to be a social majority. If the first half of the twentieth century was summed up by Aneurin Bevan’s words to Rab Butler — ‘you represent a declining class, I represent a rising class’ — its final decades, Hobsbawm argued, would be much less assured. That thesis was contested at the time, including by giants of the left such as Ralph Miliband and Tony Benn. But forty years later there can scarcely be a doubt: whereas almost 40 percent of British workers were in the manufacturing sector by the dawn of the 1960s, fewer than 10 percent are today; meanwhile, the 46 percent union density Hobsbawm found so concerning in 1978 has fallen below 25 percent in the last five years. If labour’s forward march was halted by the 1970s, it has been firmly in retreat ever since. Real wage growth of 2.9% in the 1970s and 1980s fell to 1.5% in the 1990s, 1.2% in the 2000s, and then, remarkably, turned negative, averaging -2.2% in the five years after 2010. As the social surplus shrank the sectionalism Hobsbawm feared grew and corresponded with a decline in a more general class consciousness. Yet despite these merits, Hobsbawm’s analysis was fundamentally flawed. His 1978 speech formed the basis of a sustained engagement with the changing nature of class over the coming decades which led him to conclude not only that the industrial working-class was in decline but that the proportion of society that could be described as workers was too. In their place was rising a middle-class which would increasingly provide the ‘centre’ of politics, necessitating moderation and triangulation. This seemed plausible, even prescient, as the 1990s rolled around with its end of history and the arrival of Clinton and Blair. But it always rested on shaky foundations. In reality, the working-class, best understood as that proportion of society which relies on its wages to live, is as much of a majority today as it has ever been. The latest Office for National Statistics Wealth and Assets Survey unearths this class faultline running through the UK. While it finds that the bottom 50% of households own just under 10% of the aggregate wealth in society (compared to around half for the top 10%), the reality becomes clearer when debt is taken into account. The median net financial wealth of Britain’s bottom 50%? £400. Their median net property wealth? £0. Today, around 80% of the British workforce is in the service sector. But, contrary to Hobsbawm’s suggestion, this has never meant that they are middle-class. Membership of capitalism’s middle strata is defined not by whether a person works with their hands but by relative advantages in ownership and power. The numbers indicate that the majority of British people have neither of these things, and would be driven towards poverty by the loss of their wage. Britain in 2018 has a working-class majority. 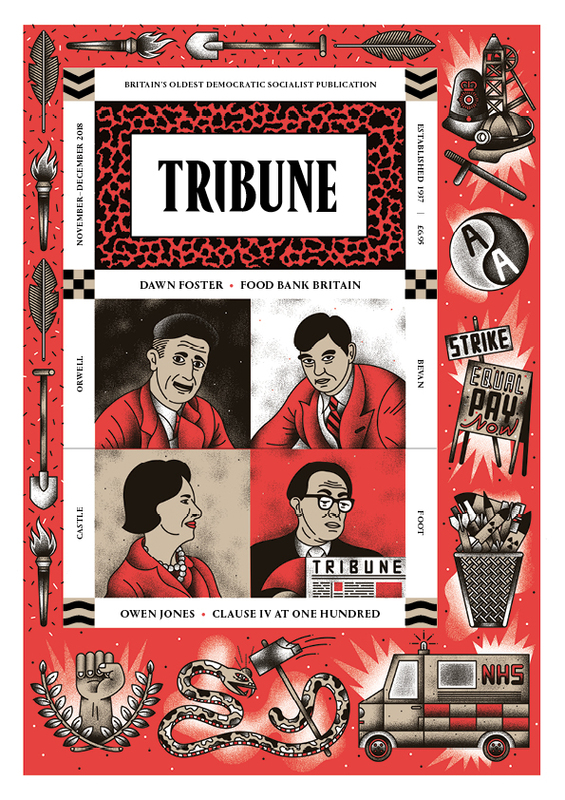 We hope that the relaunch of Tribune can help the Left overcome this sense of disorientation, at a moment of historic opportunity for socialism. Despite decades of defeats recent years have demonstrated just how much of our analysis endures. Capitalism remains the world’s dominant social system, sustained as it is by the exploitation of those who work by those who own. As inequality deepens and the gains of the welfare state recede, it is clearer than ever that these are the battle lines of any struggle which might bring about its demise. If William Mellor or Stafford Cripps encountered the economy of today, they might be perplexed by the technology behind an Apple, an Amazon, a Facebook or a Google — but they would surely recognise their paths to monopoly, their punitive work practices and the extraordinary wealth of their owners. It wouldn’t take long, either, to explain a zero-hour contract to a day labourer working on the docks a century ago. The old dogmas are as good as ever. That Socialism means nothing if it does not mean shaking capitalist society to its foundations. That the values of capitalist society are profoundly evil and therefore must be profoundly changed. And that the British Labour Party can be made a most powerful instrument for achieving Socialism at home and peace abroad so long as perpetual remedial action is taken to prevent hardening of the arteries. Our tradition of democratic socialist politics is needed now more than ever. Secret plots to sabotage a Labour government from within won’t be tolerated by the party membership. The reforms proposed by Labour’s democracy review will open our party up to the working people it was made to represent. In recent months the GMB has waged a guerrilla campaign to help workers in one of the richest companies in the world fight appalling conditions. After years on the sidelines, the Left is making a comeback in Welsh Labour. Julian Tudor Hart spent his life fighting for humane, socialist health care. Finding a way into power is hard enough without stubborn opposition from within Labour. A Jeremy Corbyn government would be the first time Britain’s socialist left was in charge of its foreign policy. Northern England has been decimated by decades of Westminster neglect. Is Labour bold enough to change it? A new generation of socialists in Manchester and Salford are building radical institutions that bring politics to life. There is a new approach to poverty in Britain: starve people out of it. In 2010 Iain Duncan Smith won his east London constituency by 13,000 votes — but now it’s trending red. In 1909 the FA forced its footballers to renounce their union. Manchester United’s refused ­— and went on strike. A century after it was introduced, it’s time to renew Labour’s commitment to a socialist economy. Politics and the workplace are changing. Britain’s unions need to change with them. Haringey Council shifted to the left after the campaign against the HDV, now it’s time to deliver socialist policies. Norway’s EEA agreement is held up as an example Britain should follow ­— but it has led to more than two decades of neoliberal policies. International speculators are playing games with our housing market ­— and we’re the ones losing. The UK singles chart has long been a barometer of popular desires. Today, it’s telling us that everything is up for grabs. It’s often said you can’t satirise politics anymore, but the Brexit fiasco ending in a socialist government would be a punchline of historic proportions. Growing up in Sweden was a dream — but today it has changed beyond all recognition. An ambitious development in Paris might point the way forward for London’s high-rise. Communist Czechoslovakia developed radical ideas about sexuality and women’s equality. In Sam Byers’ future, tech utopians and right-wing populists find common ground. As the LGBT community makes progress on legal rights, its politics are haunted by those who asked more radical questions.